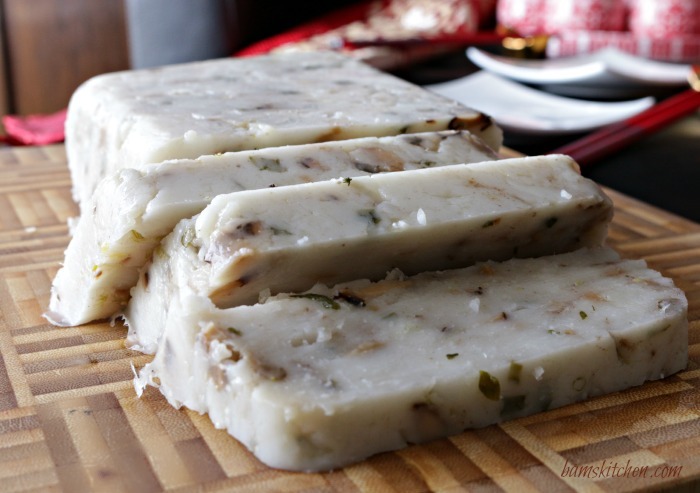 The Chinese Vegan Radish Cake (turnip cake, white carrot cake, loh bak go (蘿蔔糕) is a savory treat made with diakon radish, mushrooms, fresh herbs, spices and rice flour which is steamed, sliced and then gently pan-fried to perfection so it is crispy on the outside and soft and tender on the inside. The Chinese Vegan Radish Cake is simply just dreamy to bite into. First, the little crispy bits on the ends catch your senses and then once you take a bite the inside it is soft and mellow. The diakon radish mellows as it is cooked and it is combined with the mushrooms, herbs and spices and makes this for one hearty delightful treat. Well don’t take my word for it, give it a try yourself and impress all of your guests this Chinese New Year. 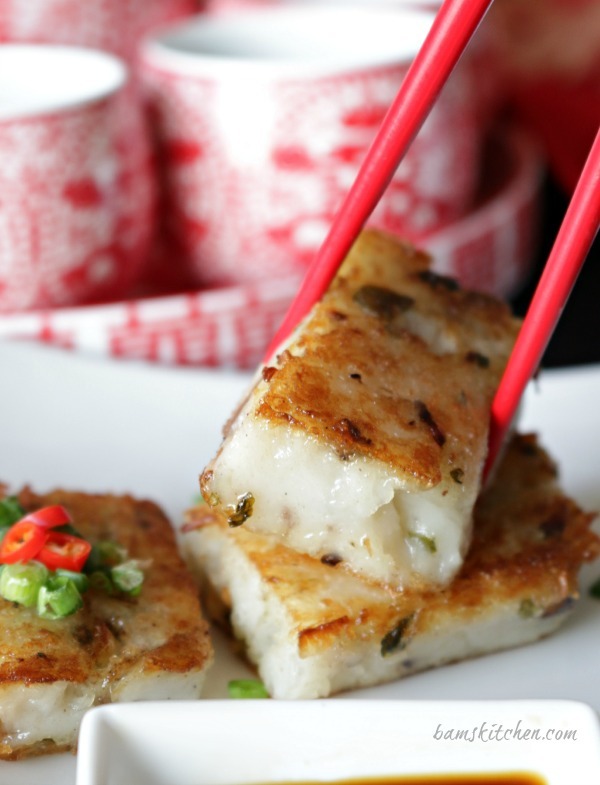 The Chinese Vegan Radish cake is also deliciously gluten-free and vegan. I love dipping it in a simple sauce of soya, dash Chinese dark Chinkiang vinegar and a little ginger for a little zest. Chinese New Year is in full swing here and I am excited to be able to share with you the events going on in Hong Kong. Today, I am guest posting over at VRAI Magazine. I have interviewed many people here in Hong Kong to get a personal twist on what Chinese New Year means to them. Please join us HERE to find out what treasured family memories they have and what special things that they do for each other during the Chinese New Year holiday season. If you have not yet checked out VRAI Magazine, pour yourself a cup of tea/coffee and pull up a chair as you are going to love their delicious recipes, home and garden, lifestyle trends and travel articles. 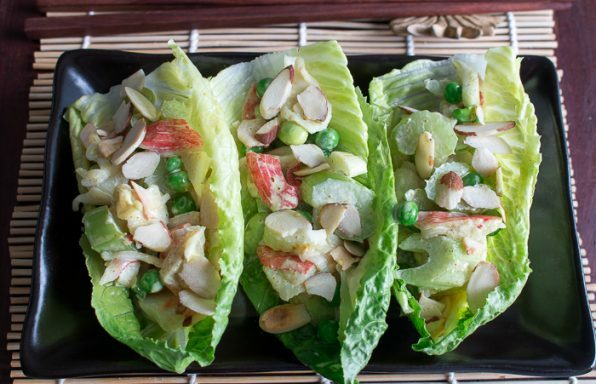 We all know that a favorite topic that might be coming up around Chinese New Year is all about the FOOD, of course!!! 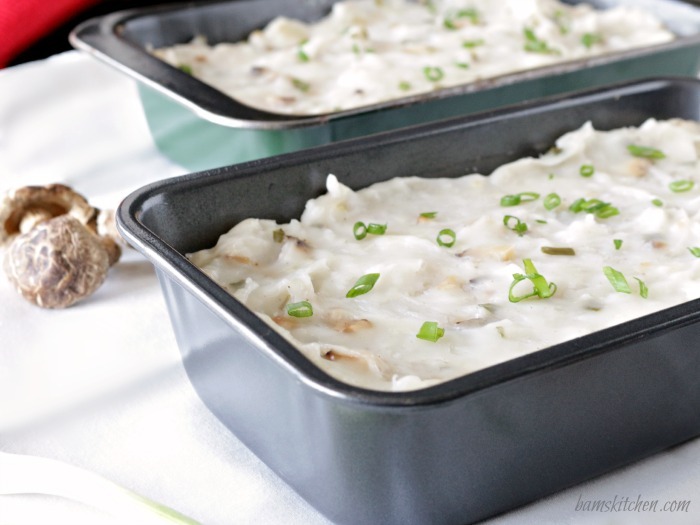 Today I am going to share with you the kicked up vegan version of Chinese radish cake. I am going to share the recipe and the recipe details here on Bam's Kitchen but you will have to visit VRAI Magazine to read up on the customs and traditions around the Chinese New Year. I know that loh bak go (蘿蔔糕), white carrot cake, turnip cake or the Chinese radish cake is generally made with Chinese sausages. I had a change of heart while doing a bit of shopping in the wet market and wanted to perfect this recipe, so I created a vegan version for you. I have actually made a recipe before for a Chinese New Year Radish Cake with Chinese Sausages and you can read my recipe HERE. One ingredient that there is really not any exchange for is what we call the diakon radish. 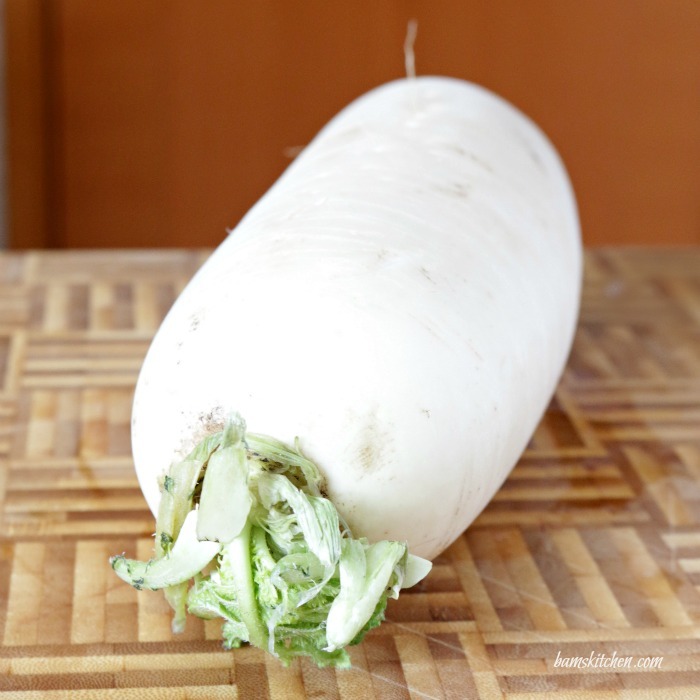 It is sometimes called an Asian white radish, white carrot, long white radish or winter radish just to name a few. I became very familiar with Daikon in Japanese cooking as it had many uses such as just being freshly grated and added to homemade ponsu sauce and used for a dipping sauce or used in making Japanese pickles... Delicious!!!! 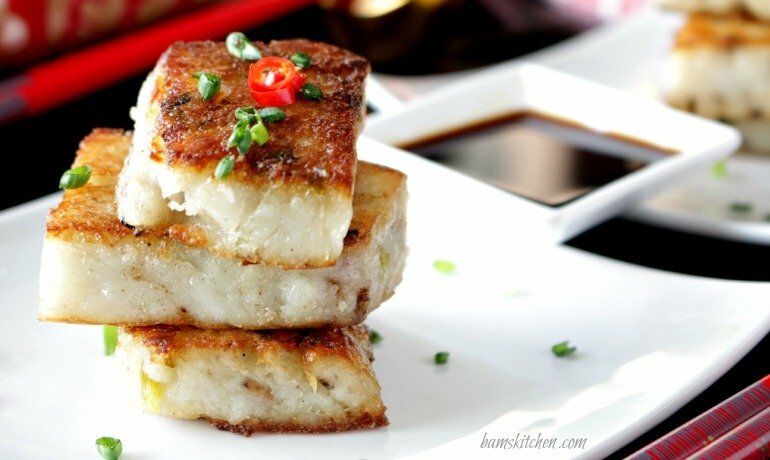 In China, the daikon radish is used to make the delightful dim sum dish, loh bak go (蘿蔔糕)/radish cake/turnip cake. You can find the diakon radish in any wet market in Asia and in the Asian grocery stores around the world. I am sorry but there is not a substitute and you cannot exchange the red little radishes in this dish or it will be too strong. 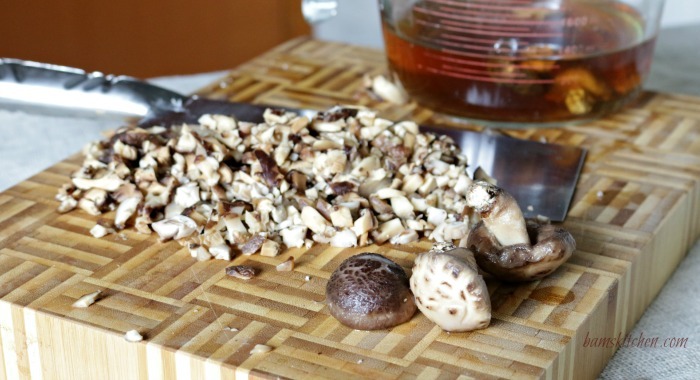 Another item I like to use is mix dried Chinese mushrooms. If you cannot get dried mushroom in your market, don't sweat it. You can use freshly chopped cooked mixed mushrooms or even just button mushrooms in this dish. I used green onions, white pepper and five spice powder to give this dish an added depth of flavour. I am not big on the taste of liver, ask any of my friends and they will let you know, and that is exactly why I choose to leave out the Chinese sausage. I don't know but for some reason, its smell and taste remind me of liver. My mom could not get me to liver with heaps of caramelised onions and a bottle of ketchup so why in the world would I torture myself now. Now maybe another type of sausage might be better but for right now the vegan version is just as lovely and even more delightful with the added herbs and spices. 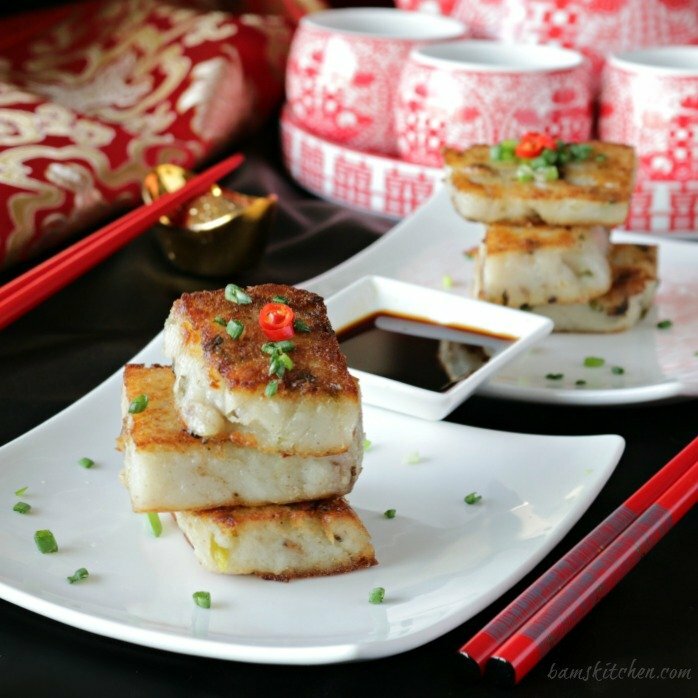 Chinese Vegan Radish Cake is not too difficult to make, but it just takes time. 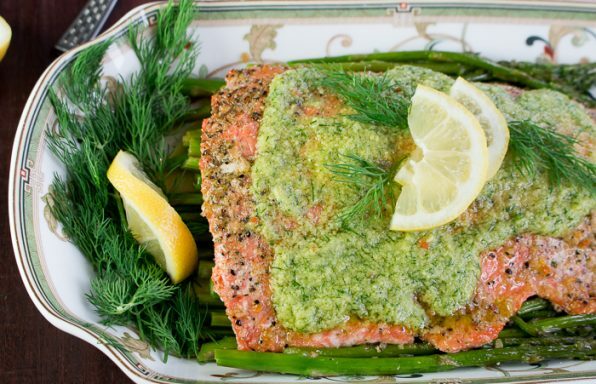 It is best to prepare and steam on one day and then leave in the refrigerator overnight or for at least for 4 hours before slicing and frying. 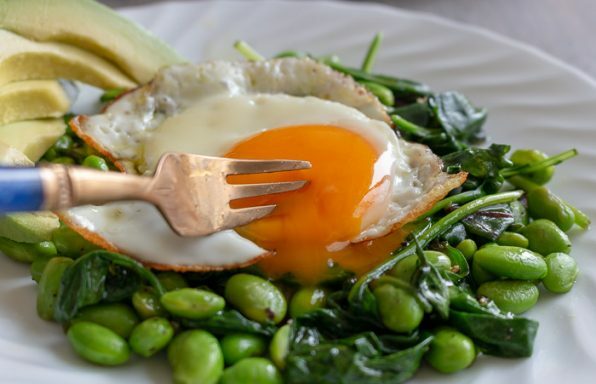 It makes slicing and frying easier. So you may ask, "How do I make a Chinese radish cake?" You do not need any special equipment to create your Chinese vegan radish cakes. 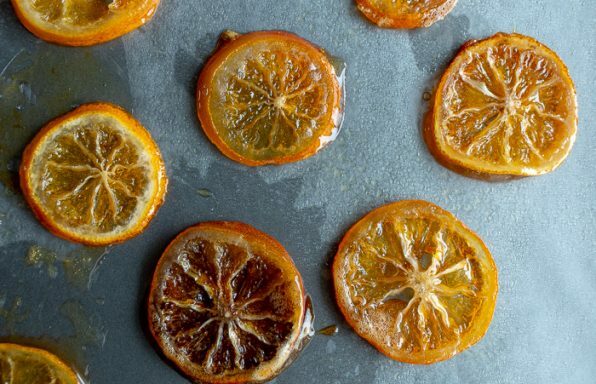 You do not need a huge steamer, wok, or even any special supplies. You can literally make a steamer out of any deep pan with a lid and a little bowl or a couple of chop sticks and a plate. REALLY!!! 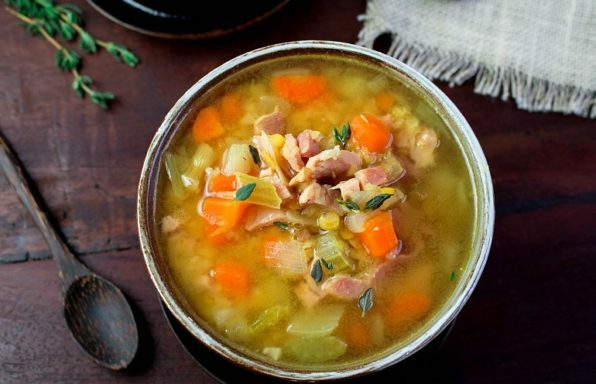 This recipe makes one huge 9x9 inch pan recipe. Instead I split the recipe into 2 smaller loaf pans or you could use a three 3 inch round pans or microwave/oven safe bowls. Cut this recipe in half if you are just going to serve 4 people and this is a more manageable size to steam. My favorite way to steam is to use my big soup pot with a lid. I put in an oven safe small bowl on the bottom upside down in the middle of the soup pan . Then, I set my Chinese vegan radish cake dish just on top of the upside bowl. It is pretty heavy so it will weight down the small upside down bowl. I then carefully add the water to the pan without getting any on the Chinese vegan radish cake. Put the lid on the big soup pan over the Chinese vegan radish cake and steam away. Alternatively, I cross two chopsticks in a wok with a lid and make the letter "X", add water to your wok, put a plate over the chopsticks and your Chinese Vegan Radish cake on top of plate and lid on top of your wok and steam away. 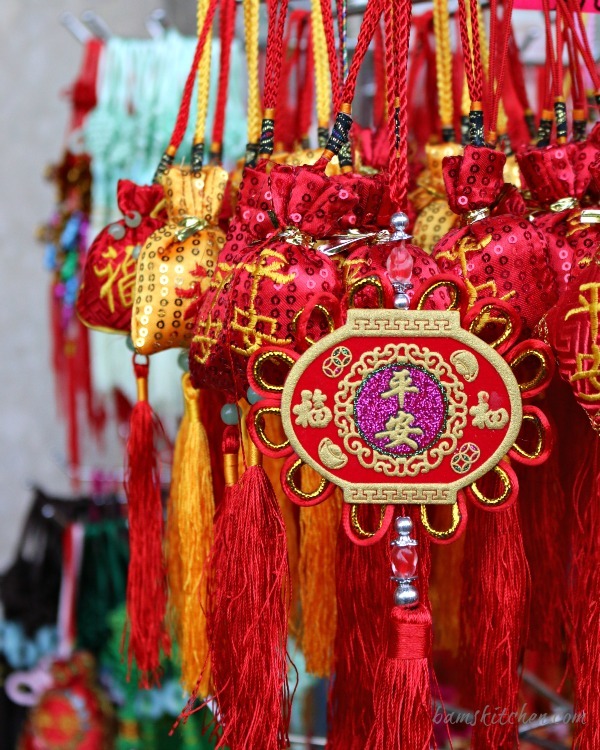 Please head on over to the VRAI Magazine where I am guest posting today and find out more about the Chinese New Years traditions from an inside perspective. Kung Hei Fat Choy! Xin Nian Kuai Le! 新年快乐! (Happy Chinese New Year) -Wishing you much happiness, prosperity and longevity! 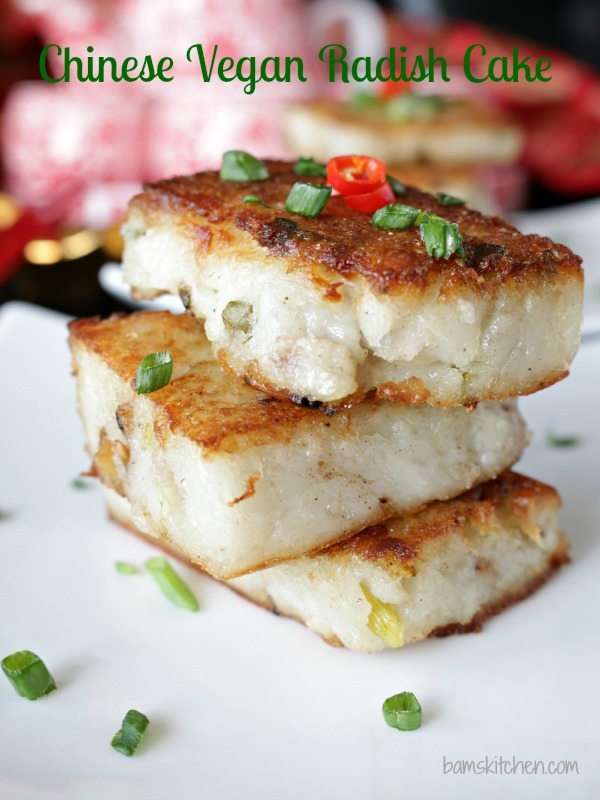 The Chinese Vegan Radish Cake (turnip cake, loh bak go (蘿蔔糕) is a savory treat made with diakon radish, mushrooms, fresh herbs, spices and rice flour which is steamed, sliced and then gently pan-fried to perfection so it is crispy on the outside and soft and tender on the inside. 1Step 1) In a large wok, place one teaspoon of oil and then add shredded diakon and cook until softened and about 1/4 cup water to finish the cooking process. (about 10 minutes) Season diakon with vegetable or chicken powder (vegetable bouillon cube crushed), sugar salt, white pepper and five-spiced powder. All the water should be evaporated. 2Step 2) Slowly add the rice flour, a little at a time, to the daikon mixture, stirring continuously. Add a little water at time to help smooth the product up to six cup of water. (The consistency you are looking for is like a soft cement or bondo for a car or maybe stiff frosting in the can (don't laugh) Don't let the mixture burn so keep it moving until you reach the right consistency. Please note: I had a very large diakon and I live in a super humid climate and all of these factors play a part in determining how much water you will need to add to your mixture. You may need to add between 5 to 6 cups of water, maybe less or maybe more, to achieve the soft cement like consistency. It is very important that you add just a little water at a time until you get to the consistency of soft cement. I needed to add 5.5 cups to achieve the consistency I was looking for. 3Step 3) Turn the burner off. Add a little at a time the chopped mushrooms and spring onions to your diakon flour mixture. Season to taste. 5Do not worry if you do not have a"big fancy steamer". You can use your wok and place 2 chopsticks at the bottom of your wok in an "x" formation, then place a small plate of top, carefully add water to the bottom of your wok about 2 inches or so on the bottom, then place your diakon cake dish on top of plate and then place a lid on top of your wok and steam. 6Alternatively if you do not have a wok, there is always plan B for steaming. I use my big soup pot that has a lid. It is very deep but not very wide so I have to split my diakon batter into 3 smaller ovenproof round dishes. I place a very small oven proof round dish upside down on the bottom of my soup pot, then I place my small bowl or diakon batter on top of the upside bowl so the weight of it holds down the upside down bowl. Then I carefully pour my water inside my soup pot about 2 inches on the bottom without getting any on my diakon radish cake. I then place a lid on my soup pot to cover and steam the radish cake. 7Step 5) Steam over high heat for approximately 45 minutes- 1 hour or until a chopstick comes out clean. 8Step 6) Allow cake to cool in the refrigerator at least 4 hours or overnight. 9Step 7) Make your dipping sauce. In a small bowl add Tamari (soya) sauce, black Chinese vinegar and freshly grated ginger, stir and set aside. 10Step 8) Slice cake into slices. 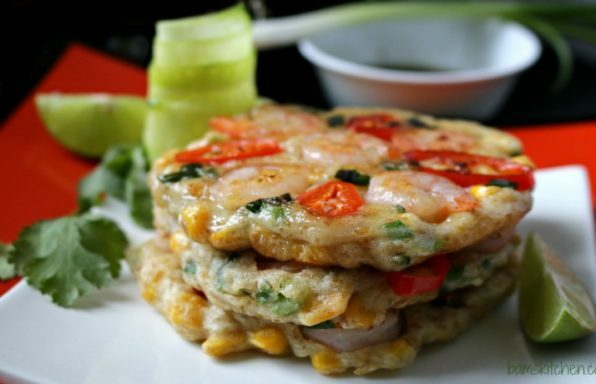 Put a little cooking oil in a frying pan and place the sliced diakon cake into the frying pan. Brown the diakon cake lightly on both sides until golden brown. Garnish with green onions and serve with dipping sauce. Serve and enjoy!